February's self-portrait was once again taken at our rental house in Phoenix. (I really need to get out more, don't I?) 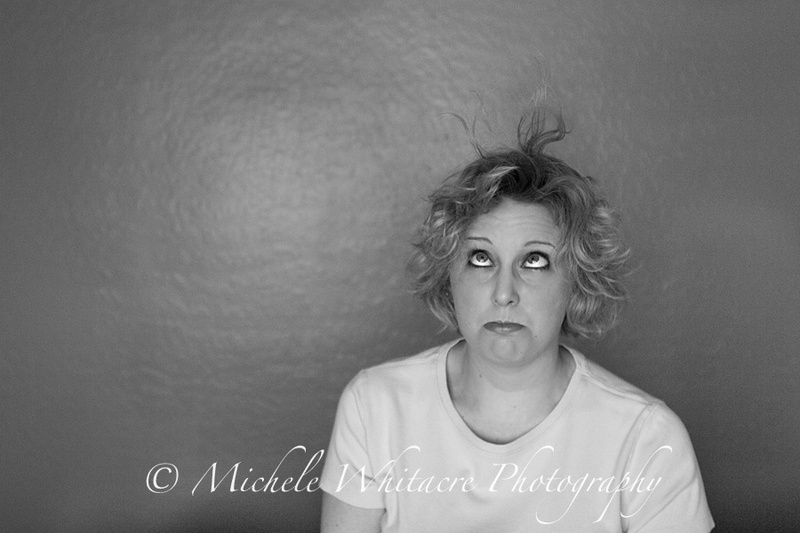 In this photo I am attempting to show my frustration and exasperation with my crazy, insane hair. I'm not sure if I succeed or if I just look like a bit of a lunatic. I decided a year ago to grow my hair out from the super short style I had stupidly decided to cut it into. (Why don't I ever learn?) In at attempt to keep some sort of style during the growing out process, and with hopes of avoiding the 80's mullet look of my childhood, I let the top and sides grow, while continuing to keep the back trimmed. Once I moved, and no longer had a familiar hairstylist, I basically just gave up all attempts and let it grow. It's finally reached a length where I really need to decide on some sort of actual style, but I have no clue what I want to do with it! Since it has no shape to it, I can't get it to cooperate no matter what I try to do with it, and it has been a huge source of frustration recently. While I'm loving taking my self-portraits, I'm finding myself struggling to capture images of myself that are completely in focus. It's challenging to know just where exactly to set the focus without a target in the frame, and using the auto focus feature is hit or miss. If anyone with self-portrait taking experience has any suggestions, I'm all ears! At least I got to laugh instead of cry this month! Thanks!!!! My hair has been a source of frustration too. I got a bad cut from a new stylist and let my hair grow out from that. Then I went to get it cut and shaped by a different lady and I told her not to cut it as short as last time. And what does she do? She cut it SHORTER!!! So now I'm trying to grow it back out again and I'm not happy about it. That is so frustrating when you're working on growing it out and someone cuts it all off again. I've had that happen to me too. thanks again for sharing yourself!